Filmworker offers a unique, never before seen look beyond the veil of Stanley Kubrick's megalomaniacal genius as told by his right hand man, Leon Vitali (Lord Bullingdon in Kubrick's Barry Lyndon), who abandoned a promising acting career to service Kubrick's grand visions. The documentary is illuminating in several regards, particularly concerning the creative process, which tends to be dwarfed by a writer or director, keeping the many people involved that help bring these ideas into a cinematic reality out of our minds and the spotlight. The narrator (which I believe is the director Tony Zierra) likens Leon to a moth who is burned by flying too close to the light source. This is a fairly apt metaphor on the surface; however, it's somewhat unjust to Vitali, who holds no regrets towards his career shift, which many would construe as odd, and eerie as it may be, he cannot say one unkind word about Kubrick despite being constantly overworked and occasionally berated, in a manner Vitali refers to as "an angry Gordon Ramsay", when tasks were not completed to Kubrick's overly high standards. It is definitely a bit insane to think that Vitali would abandon his acting career when he was at the top of his game to continue his creative endeavors to serve as the Igor to Kubrick’s Dr. Frankenstein (as Mathew Modine so eloquently puts it). But then again, when you see the finished product — "A Stanley Kubrick Production" — in all its iconic majesty, it's not that hard — at least not for any die-hard film lover — to understand why someone would want to stand so close to and aide such greatness. Aside from giving us new insight and anecdotes regarding Kubrick, the film's biggest win is how much perspective it provides into the creative process. Namely, it reminds us how a majority of the credit being pinned to the backs of one (or maybe two) individuals is an injustice to all those "little guys" who serve beneath and are fundamental to the craft of any masterpiece. In the case of Kubrick, Leon Vitali is an unsung hero, and is very much deserving of some love. He is responsible for several of the most iconic aspects in Kubrick's last three masterpieces, in addition to serving as "caretaker" of Kubrick's estate, ensuring restorations and the like meet that gold-star Kubrickian standard. There are many revelations unearthed here that are best experienced through this documentary, so I will take care not to spoil them here; however, just know that it will be nearly impossible to watch The Shining, Full Metal Jacket, or Eyes Wide Shut again without thinking of Vitali's blood, sweat and tears that are embedded into the DNA of these productions just as much as Stanley's. The most shocking thing about the film is Vitali's continued affection and adoration for the long-deceased director. When coerced to say at least one unkind word about the man he stood in service to for several decades, Vitali is unable to, despite the many instances of mistreatment. It's oddly touching, yet sad, with a tinge of creepiness, but Vitali must be commended for his efforts — or his sacrifices, should that be your outlook. Regardless, it's so so wonderful that he's finally getting due recognition for the work he's done behind the camera. The anecdotes and stories told in the film are fantastic, especially Mathew Modine and R. Lee Ermey'a (R.I.P. ), and they solidify this film as a must-see for any film nerd or Kubrick fanatic. The film has no shortage of wonderful moments, such as seeing Tim Colceri, AKA the helicopter gunner from Full Metal Jacket, discover the nuances of his small, yet crucial character, but the caliber of filmmaking on display here is far from Kubrickian and much of the execution comes off as amateurish. If it weren't for the stories being told about one of cinema's most infamous American directors, there wouldn't be a whole lot here of value to latch onto. Filmworker is littered with a lot of shoddy qualities from overexposed cameras to dissolves during interviews in an attempt to blend edits, odd zooms during the middle of interviews and wonky tilts of the camera. This is a story that needed to get out into the light of day, but it's a shame that those involved didn't take the necessary time to make this shine as bright as it could or should've. With that in mind — and circling back to the moth — the real question is: who really got burned by the light source, the filmmaker of this documentary or Kubrick's prized filmworker? The answer is ultimately for you to determine. 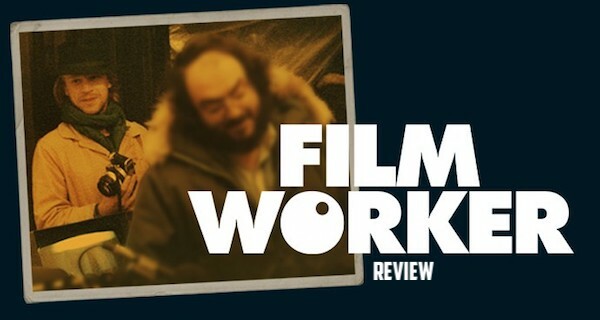 Overall, Filmworker fills us with new perspective into the artistry and craftsmanship of making a Kubrick film, opening our eyes along the way, not just to the man, but the many people who stand behind a creative vision, bending over backwards to make it as good as possible. Despite this documentary's many blemishes, the sheer magnitude of the stories centering around the oddly endearing relationship Vitali and Kubrick shared are enough to maintain interest and salvage any wreckage. Rating: 3.5 Kubrick dolls outta 5. What do you think? Was this glimpse into Kubrick enlightening? How did Vitali and Kubrick's relationship make you feel? We want to know. Share your thoughts and feelings in the comments section below, and as always, remember to viddy well!